REVELSTOKE, BC – Mt. Begbie Brewing has announced the release of a new limited edition beer that was brewed using an ingredient that would otherwise have gone to waste. Our Daily Bread (3.8% abv, 20 IBU) is an ale that was made with bread provided by Food Connect, a food recovery and redistribution service run by Community Connections Revelstoke. The organization receives more than 25,000 lbs of bread products annually, which is much more than they can distribute to their partners, meaning that much of the bread ends up going to landfill. Our Daily Bread is intended to bring attention to the issue of food waste, and also raise funds for the Community Connections Revelstoke Food Bank. 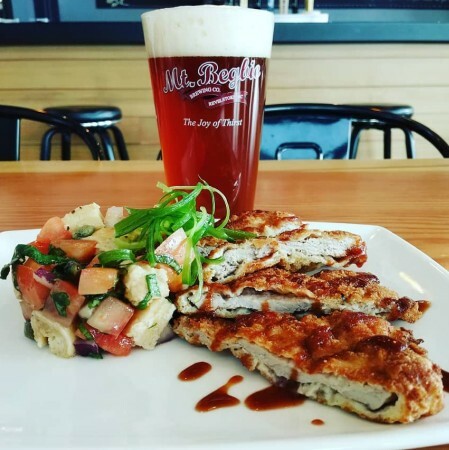 It’s available now on tap at the brewery along with two paired food dishes – breaded pork cutlet with panzanella salad, and deconstructed apple pie – that were also made using bread as in ingredient.